Let me begin the week by wishing someone special a very happy birthday! 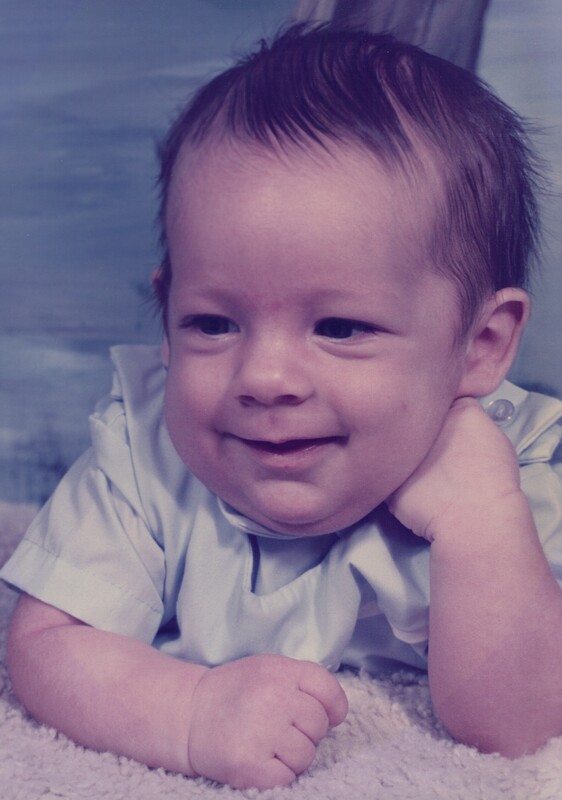 Our youngest son, Brad, was born, thirty-one years ago, today. Brad was a very welcomed surprise addition to the family, and our family wouldn’t be the same without him. 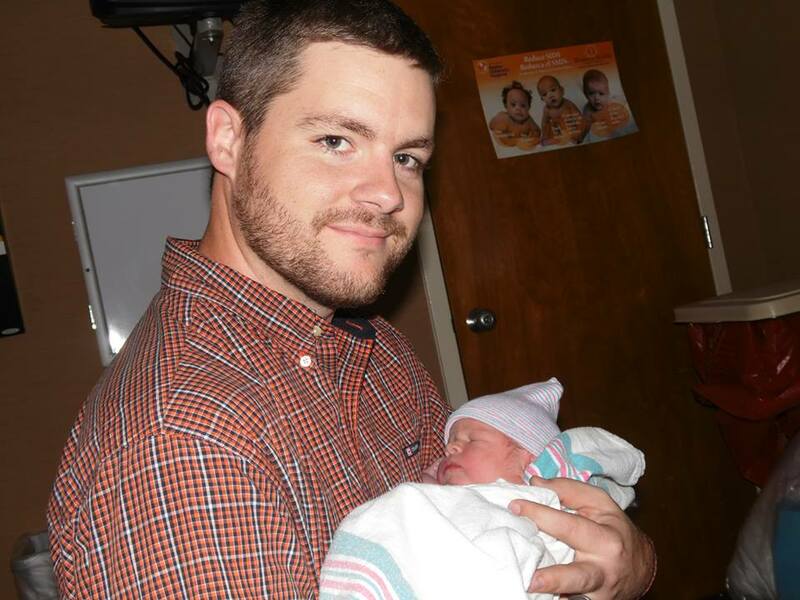 Delivering Brad proved to be difficult (10 lbs, 9 oz. natural childbirth), but raising Brad was easy. He was a delightful, easy-going, baby and child, always willing to go along with whatever his siblings wanted to do. 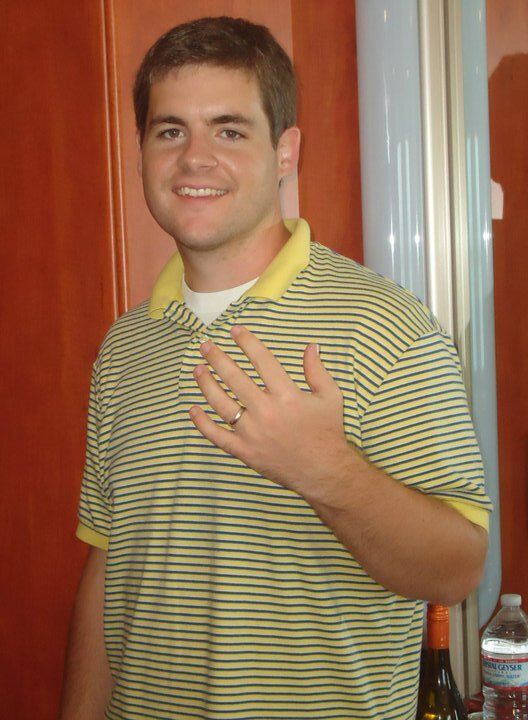 Brad made good grades in school (except for the year he refused to do a required project, and had to repeat the class), and worked his way through high school and college, at a local bank, paying most of his tuition costs, himself. 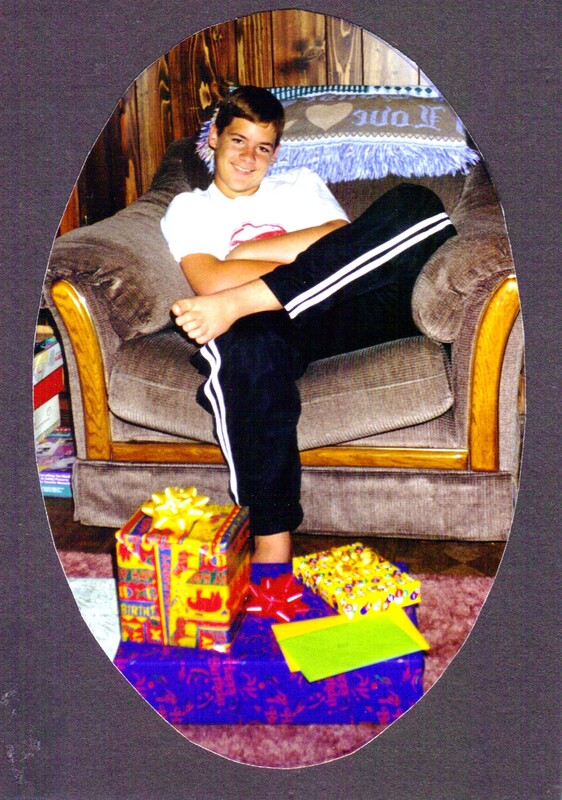 Brad’s easy-going personality kicked into overdrive during adolescence, and he got along well with everyone. My chief complaints with Brad, as a teen, were these: his room was always a mess, he was tardy to high school a lot, and he was [and still is] a procrastinator. The years have flown by, and now our baby boy is a grown man with a family of his own. In fact, we took note, this weekend, when we celebrated his birthday a little early, that, on this birthday, Brad is [almost] one-half as old as his mama! I celebrated my 31st birthday, shortly after giving birth to him. In other news, I’m happy to report that Ed mowed down most of our garden over the weekend! I don’t know which one of us was the happiest to see it go, but it’s gone. The last of our tomatoes are in the kitchen, still waiting to be canned, but, after that, we’re done! Look out beach, here we come–as soon as I am able to travel! I haven’t been feeling my best, lately. Man, this summer heat is really oppressive! Being outside is miserable, unless you go out first thing every morning, which I do. Once I finish with my chores, I just stay inside until late in the afternoons. Ed spends more time outside than I do, but the heat doesn’t seem to bother him as much as it does me. I’m hoping the temperatures will be a little milder under our favorite oak tree at St. Simon’s Island, when I get there. The highs are supposed to be in the upper 90’s all of this week. We’ve had a couple of news worthy incidents happen in our area, lately. First of all, a few days ago, our oldest son spotted a rattle snake crossing the road beside his house. He ran over the snake with his car, but it didn’t kill it. So he called our son-in-law, who went down and shot it. This makes me nervous, because this is the same road I walk on for exercise! I’m always vigilant, but I’ll need to be extra vigilant from now on! Late one afternoon, last week, a freak storm blew up. The wind was so gusty, it blew our grandsons’ trampoline out of their yard, and across the road! (the same road with the snake crossing) The trampoline flew up on its way out of the yard, hit the roof of the back porch, and did a little damage there, too. Fortunately, our oldest son was driving his wife’s car that day, or her car would have been parked in the path of the flying trampoline, as well. Fortunately, the trampoline looked worse than it actually turned out to be. It’s been repaired, and is still usable, thank goodness. Today has started off with a bang–literally! A family of squirrels recently moved into the pine trees above my windmill/flower garden. They’ve been making quite a mess, while feasting on pine cones each day! This morning, Ed declared war on them by shooting up among the trees with his shotgun–at 7:30 in the morning! Would you believe two of the squirrels actually had the nerve to stay in place after being shot at? They vacated following the second shot, but I’m sure they’ll be back. I got a look at them, and they looked mighty fat and happy! Ed and I are officially finished with the gardening season of 2015, and it feels SO good! We canned the last of our tomatoes on Wednesday. I was bummed when one of our pints of tomatoes didn’t seal, but that happens sometimes. In all of our canning experiences, that was only our third mishap–and we’ve canned many jars of fruits and vegetables during the past three years. Ed’s already mowed down almost all of the old garden plants. Only my zinnias, some old corn stalks, a few peanuts, and some watermelons remain. We plan to try some of Ed’s ‘home-grown’ boiled peanuts, this weekend! Ed had a doctor’s appointment, on Tuesday, for his three month’s checkup. We use the same primary care physician, and while Ed was seeing the doctor, he happened to ask Ed about me and my back problems. Ed explained that I had been unable to get in to see a specialist, yet. He went on to explain how the Prednisone I’d been prescribed on my last visit had helped my sciatica, until it eventually wore off. The doctor then sent me a prescription for another round of Prednisone, to get me through until I can see a neurologist, on July 21. God bless him! We’re in the midst of another heat wave. The rain has left us, and our temperatures are reaching back into the high nineties, again. Hello, summer! By 9 o’clock, each day, it’s already hot, but not as hot as it is by 3 o’clock!!! I’m keeping a high velocity fan blowing in the chickens’ pen, in an effort to keep them as comfortable as possible. Happy chickens lay more eggs! Ours must be pretty content because our current egg count, since January, is 988 eggs from nine hens! Our daughter and her husband FINALLY got their a/c repaired, yesterday. They’d been relying on a smaller window unit for over a week and a half, since their a/c drain tray to the central unit had developed a leak and flooded their ceiling. Did I mention the entire family had been sleeping in the living room for a week and a half, as well? Last Friday, Ed and I were in a Wal-mart Neighborhood Market when we saw somebody we hadn’t seen in almost two years. Does anybody remember me blogging about Alex, the little baby boy our daughter used to keep? Alex who was deaf, but got cochlear implants during the two years our daughter was keeping him? Alex, whose mother got cancer and died this past March, at the age of 30? Well, Ed and I saw Alex, who happened to be shopping with his grandparents! He’s grown taller, but he still looks the same. Believe it or not, little Alex turned 4 in February. That little fellow sure has been through a lot in just four short years, but, as usual, he was wearing his smile. There’s a birthday celebration in the family, this weekend. 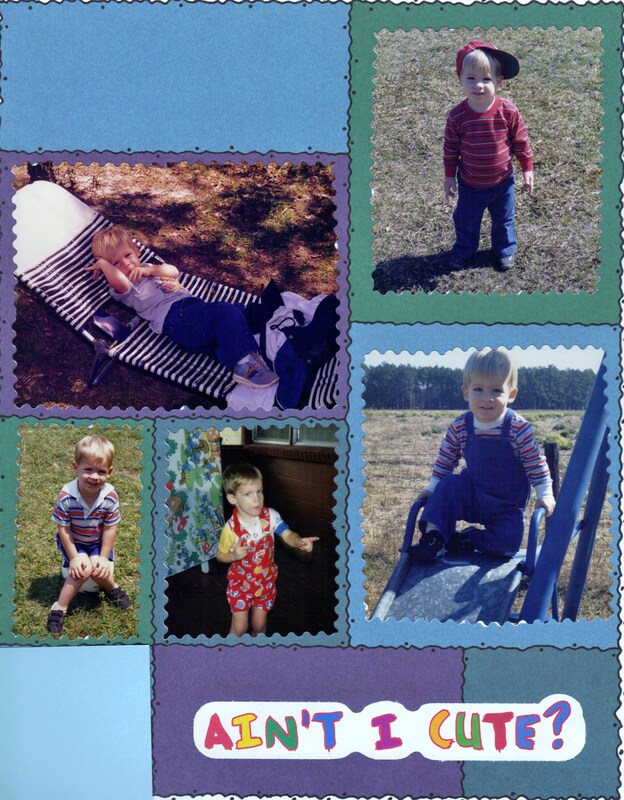 Our youngest, Brad, will turn 30 tomorrow. How in the world did that happen? If all goes well, the family will be gathering this evening to help him celebrate. Because mamas like to look back and remember ‘the good ole’ days’, I’m re-sharing the birthday video I made for Brad on his 28th birthday. Happy birthday, son. Just like the words of the song say, “You make your mother proud.” I love you! Happy, happy, happy Birthday, Brad! Twenty-eight years ago, I gave birth to my last child. I was thirty years old at the time, and not prepared for the twenty-one hours of labor that it took to get him here! Today, that child is a grown, twenty-eight year old married man, who is about to become a parent himself. My how the years have flown, and times have changed! I had the pleasure of spending some time with Brad, on Monday afternoon. He finished work early, and came by here, on his way home, to pick up his social security card. We spent several hours just talking. It was so good to have that time together! It meant a lot to this tired, old mama. I spent a lot of time trying to figure out what I wanted to do in honor of Brad’s 28th birthday. I settled on making a birthday montage. For me, the most difficult part of making a video montage, is choosing the song. I’ve discovered if I look long enough, and hard enough, I’ll find just the right song–and I did. I couldn’t have said the words better, if I’d have written them myself. The title? “A Mom’s Song”. Once I put the montage together and watched it, tears came to this mama’s eyes. Where did all those years go? Just like the song says, this mama is very proud of the man her little boy grew up to become. He’s a wonderful husband, and I have no doubts, he’ll be a fantastic daddy as well. He’s a pretty darn good son, too! Hello, and welcome to The Wednesday Hodgepodge! We’re back after taking a holiday last week. As always, our hostess, Joyce, has prepared another set of thought-provoking questions to send the mind whirling…My head is still spinning after reading #2 and #5! Thanks, Joyce. I don’t know how you do it, but you do it so well! 1. How often do you check the weather? How do you check the weather? I never worry about the weather, unless I’m planting/planning something (like a garden or a vacation), or if there is a hurricane headed in our direction. I usually check the weather, the old-fashioned way, by watching our local forecast on television. 2. Since this is volume 84 of the Wednesday Hodgepodge, and since I got married in 1984, and since I’m attending a wedding this weekend it only seems right to post something related here. I tend to disagree–and agree. I think you should definitely get to know someone before jumping into marriage, but I also know that things happen, and sometimes people change–no matter how well you think you know them. I believe that true happiness in marriage is, in my opinion, a blessing from God, and I’m saddened to find that so few couples seem to have it these days. 3. Do you like to dance? Have you ever taken dance lessons? I love to dance, but I’m not very good at it. However, that didn’t stop me from hitting the dance floor as a teenager! Even today, hearing good music makes me want to get up and dance! I’ve never taken dance lessons, but I am in awe of those who have, and I love to watch them dance! 4. Fresh from the oven peach pie or home made peach ice cream? Pick one. Neither! I prefer home-made peach cobbler over both choices! Of course, if I had to choose between pie and home-made ice cream, I’d take the pie. 5. Should people accept unfairness and learn to make the best of it? We all know that life is not always fair, so yes, we might as well learn to accept this fact, and make the best of our situations–in all circumstances. 6. The top five all time summer movie blockbusters (released between May and August and grossing at least 100 million dollars) are-Jaws, Raiders of the Lost Ark, Star Wars (the original), Ghostbusters, and ET. Which one’s your favorite? No question about it–Jaws! It was one of the most unforgettable movie experiences I’ve ever had. Ed and I went to see Jaws, then went back again with my brother and his wife–just so we could watch their reactions during the movie. To this day, I still don’t like getting in the ocean anymore! 7. If given the chance, would you like to visit the moon? No, the moon doesn’t look like a place I’d like to visit. Today is special in our family! 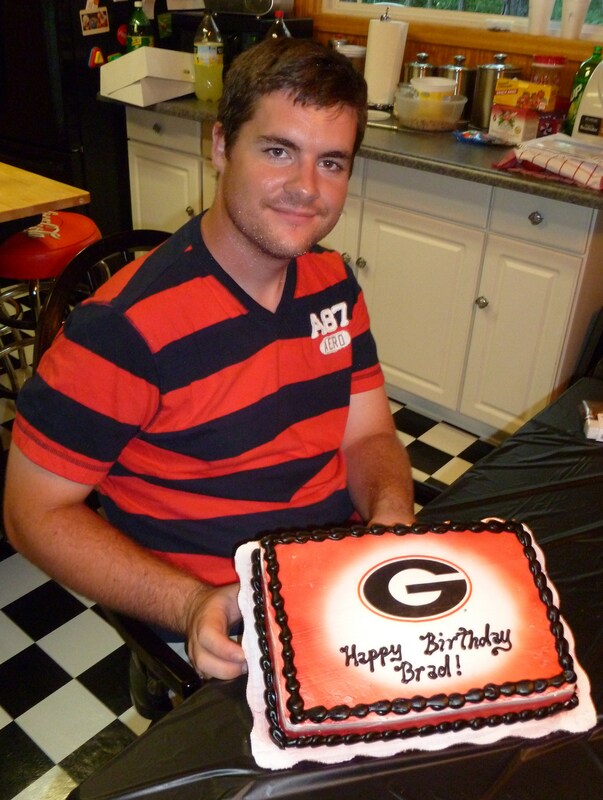 Brad, our youngest, is celebrating his 27th birthday today! He was our “7-11” baby, who weighed in at “10-9”. Happy Birthday to Brad! It’s hard to believe that it’s already been twenty-six years since our last child, Brad, was born. I still remember that day like it was yesterday. I remember all twenty-one hours of labor, and I remember the birth quite well, too! After it was over, I remember looking over in that little isolete…and seeing what looked like a 3-month-old baby! Brad weighed in at a whopping 10 pounds, 9 ounces! Hello, world! Nobody is exactly sure what time Brad finally arrived. His birth was so intense, everyone forgot to look at the clock! Time passes, babies change, and before we knew it, our little dark-haired baby had grown into a little blonde-haired boy, with a sunny personality. Brad always kept us smiling. More years passed, and our little boy continued to grow into a young man. He was still funny and amusing, and always had a story to tell. Just two weeks, and two days ago, Brad became a married man! Special birthday wishes to Brad today! May your life always be filled with as much joy as you’ve always given to us!